Brazil, Argentina, Uruguay, Colombia, Panama, Costa Rica, Honduras, Nicaragua, Guatemala, Canada, Indonesia, Australia, Malaysia, Singapore, Thailand, The Philippines, Vietnam, Laos, Cambodia & Ireland. That is the list of countries that I have visited since I last had a ‘real’ job in 2010. 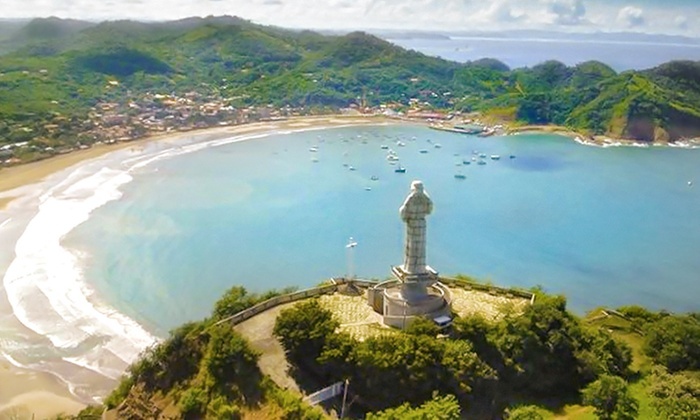 I currently live in the beach-town of San Juan del Sur, Nicaragua, famous for it’s surf breaks and Sunday Funday pool parties. You might guess that i’m a trust-fund baby or that I won the lottery, but it’s neither of those things. I’ve managed to travel the world for more than seven years due to something called ‘Matched Betting’. Don’t get the wrong idea, i’m not a big gambler. I like the occasional punt, and enjoy a day at the races, but I’ve never been very good at it. Fortunately, matched betting is different. It’s a way to make risk-free cash from bookmaker sign up bonuses and promos. These offers are everywhere. Turn your TV on at the weekend and you can’t get away from them. What most people don’t realise is that it’s possible to guarantee a profit using these offers. That’s where Matched Betting comes in. By applying a mathematical formula, and using a betting exchange to cover all possible outcomes, matched bettors can make thousands of dollars every month from the comfort of their own home…or a hammock on a Caribbean island…or a Buddhist temple in Thailand…or the top of a Nicaraguan volcano (*all places that i have actually placed bets). I first discovered this amazing way to make money while working an office job in Scotland in 2008. There was an online forum that had a long post with instructions for beginners. I must have read that post at least once a week for the next two months before i got up the nerve to place a bet. It seemed too good to be true. Once I got started though, there was no stopping me. Within a year I had earned enough that I was comfortable quitting my job and buying a one-way ticket to Argentina. The next three years were spent in Latin America before chance took me to Australia. When I arrived I was pleasantly surprised to learn that Aussie bookies are very generous. In fact, they were so generous that they paid for a four month trip around South-East Asia. They’re still paying the bills now that i’m back in my newly-adopted home of Nicaragua. It’s been an interesting seven years – both for me and for Matched Betting. Back when i started hardly anyone knew what Matched Betting was. Now that’s not the case. It has blown up in the U.K. over the last 3-4 years and now you can read articles about it in The Guardian or The Telegraph. You can also find threads about it on forums like MumsNet (it’s perfect for stay-at-home mums), TheStudentRoom (same goes for students) and MoneySavingExpert. And there have been advances in the tools available, making it even more accessible to beginners. What has been lacking is a website that is dedicated to Matched Betting in Australia. Australian gambling laws are different from the laws in the U.K. (in fact they change from state to state), and Australia has different bookmakers and different types of offers. This means that U.K. focused Matched Betting guides have limited use in Australia. That is why we have created bonusbank. The tools and tutorials on this site can help anyone in Australia or New Zealand to make money from Matched Betting. It doesn’t matter if you are useless at maths and know nothing about sports, we do all of that for you. 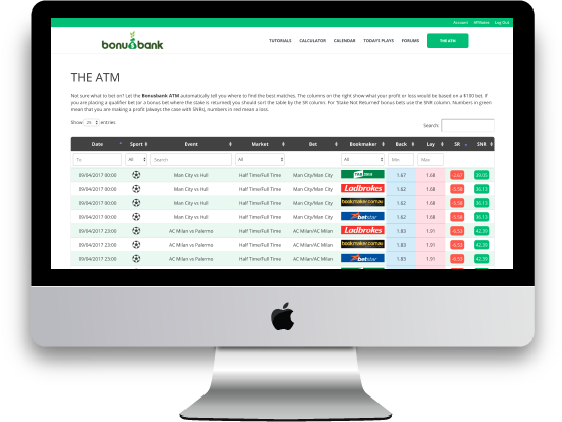 The bonusbank ATM – the only software of it’s kind in Australia – identifies the best matched betting opportunities around. Our calculator then tells you exactly how much you should bet to maximise your profits. And, if you’re still unsure about something, the bonusbank community forum is always available to help. It’s everything that i wish i had when i was starting out. At this point some of you are probably thinking ‘What’s the catch?’. That’s how i felt back in 2008. To find the answer to that question you should check out our FAQs. When you’ve done that you can then sign up for a Free account where you will have access to all of our beginner tutorials, our calculator, and a Lite version of the ATM. We’ll even give you step-by-step instructions on how to make up to $100 from a bookie sign-up bonus. We’re confident that after you have completed our beginner tutorials you will be convinced of the potential of Matched Betting. You will be ready to upgrade to Premium and start making a serious, long-term, tax-free income. There’s no obligation to use that income to travel the world – you could use it to pay off debt or buy a car – but if you do, and you ever find yourself in Nicaragua, look me up. I’ll buy you a beer! Can bonusbank be used by residents of countries outside of Australia and New Zealand? The matched betting principals can be applied to bookies in the UK or anywhere else in the world, so you could definitely use our tutorials to learn how everything works. Our calculator and Bet Tracker spreadsheet can also be used anywhere. The ATM, which we use to find bets, includes odds from some bookies that also exist in the UK – Ladbrokes, William Hill, Paddy Power (Sportsbet), Unibet – but for other bookmakers you would have to manually find bets, so it will be a bit more time-consuming, but you you could definitely give it a go.